An academic panel investigating the work of South Korean researcher Hwang Woo-suk said Tuesday he fabricated data to support his claim that he cloned human embryos and extracted stem cells from them– capping the spectacular fall of a man once lauded as a pioneer. The latest revelation by the Seoul National University panel was another disappointment to scientists and patients alike. Hwang’s claim of a cloning breakthrough had offered hope to millions suffering from paralysis and debilitating diseases such as Alzheimer’s, Parkinson’s and AIDS. The same panel concluded last month that Hwang falsely claimed in 2005 to have developed 11 stem cell lines tailored to specific patients. Hwang ”did not have any proof to show that cloned embryonic stem cells were ever created,” the panel said in a report, disputing the central claims in Hwang’s 2004 paper in the journal Science. In the paper, Hwang said he had cloned a human embryo and extracted stem cells from it. But the university cast doubt on whether an embryo was cloned, saying there is a high possibility it could have merely been a mutated egg, which could appear to have similar qualities of an embryo. ”The 2004 paper was written on fabricated data to show that the stem cells match the DNA of the provider although they didn’t,” the report said. The 7th paragraph finally addresses the dog cloning. It is an AP story, but there must be some editorial discretion about headlines. Is it too much to ask for the Times to do what we were taught to do in our grade school weekly have the headline and story match? US Finally Fighting Mideast Information War-and the Times Doesn’t Like It. The US has finally begun to engage outlets like al Qaeda Jazeera and the NY Times doesn’t like it one bit. Good. It’s about time we started fighting fire with fire. If state-run media continue to slant the news in the region against us, we have to respond in kind. The Times should hardy act morally superior. This is a war, not an Upper East Side cocktail party. More Selective Reporting From…Who Else? Camp Katrina writes how it appears that "insurgent attacks" on US troops are now reported with selected facts omitted. And these details always seem to soften the malevolence of the terrorists or the nobility of the soldier’s mission. This is not the first time this has happened. Remember this? In a City of 7 Million, the Only News is That Damned Balloon. 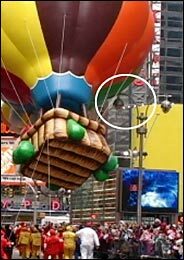 With apologies to Mary and Sarah Chamberlain, the story of the parade balloon hitting the light pole and causing them injury has hit Abu Graib status. The Times has published no fewer than 4 front web page reports, as well as two multi media features (a video and slide show) and God knows how many follow ups and op eds are forthcoming. To show that the insanity is not exclusive to the Times, the City will form a commission to investigate the accident. After four years of tight budgets and deepening debt, most states from California to Maine are experiencing a marked turnaround in their fiscal fortunes, with billions of dollars more in tax receipts than had been projected pouring into coffers around the country. The windfall is a result of both a general upturn in the economy and conservative budgeting by state officials in recent years, and it is leading to the restoration of school funding, investments in long-neglected roads and bridges, debt reduction, and the return of money borrowed from cities and counties. In Sacramento, officials are setting aside part of a multibillion-dollar revenue windfall to build up California’s depleted cash reserves. Delaware has appropriated money for a pilot program for full-day kindergarten, and Florida will spend nearly $400 million on a new universal preschool program for 4-year-olds. Some states, including New York, New Jersey, Hawaii and Oklahoma, are pouring significant new sums into public colleges and universities after several years of sharp cutbacks. Both girls will be "just fine." One had six stitches. There will be no litigation. You can all exhale now. Update: The Political Teen has some commentary on how NBC dropped the ball on covering the mishap when it was actually news. Predictably, the Times is exposing themselves as being left of Dianne Feinstein in this editorial which blasts Supreme Court nominee Samuel Alito as being out of the mainstream and an ideologue. The catalyst of this, of course is the memo written by Alito in 1985 which I blogged about previously on his disagreement with abortion as a constitutional right. Alito put it in the context of an attorney seeking a job that involved advocacy. Feinstein seemed to accept the answer. She was asked if she found his answer satisfactory. "The question is, Did I believe he was being absolutely truthful, and I did," she responded. She said he "was very sincere, he was very direct in answering my questions, he clearly is well-steeped in the law, has a good mind, is an able thinker." Evidently what is good enough for Feinstein (who probably won’t vote to confirm him anyway, but refrains from branding him divisively) isn’t good enough for the Old Gray Lady’s editorial board. That statement strongly suggests that Judge Alito is far outside the legal mainstream and that senators should question him closely about it. First, he has extreme views on the law. Second, Judge Alito does not respect precedent. Third, he is an ideologue. I would expect that the Times would cry in their beer and be intellectually dishonest about whomever Bush nominated. I didn’t expect them to be so blatantly passionate about it. I say again, this is good news. Linked to The Political Teen.